Sites are the physical venues where you offer classes at places like Newtown Arts Club, or Parramatta High School. A site will have one or more rooms. Sites can also be Administration centres where you take enrolments and payments. Rooms are where the classes will be held, a class may be held in one room all year, or may change. Rooms will have names like room 14, studio 6, the library. Rooms can have a seated capacity. To access the site records go to either the splash screen and click on Sites or the onCourse menu resources → sites . This will open the Sites list view window. Here you can set the site name and address details. 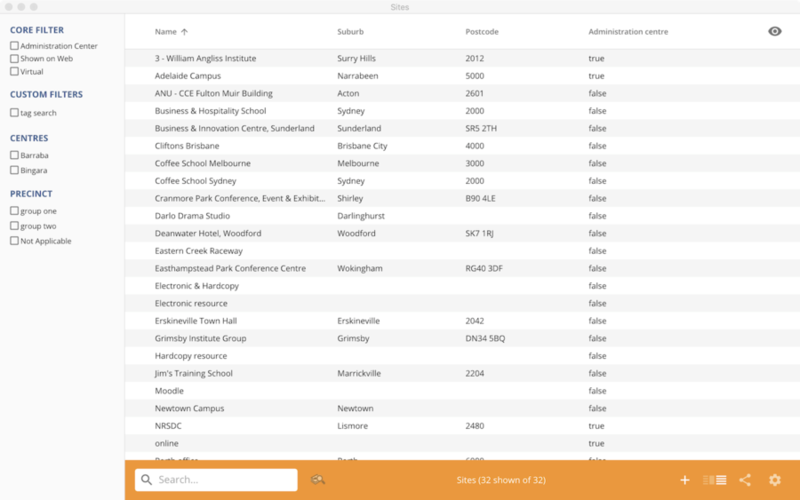 You can also access this sites Kiosk view by clicking the Kiosk button in the top right of the record. If you are running an integrated onCourse website, you will have access to full location searches and directions via Google maps. 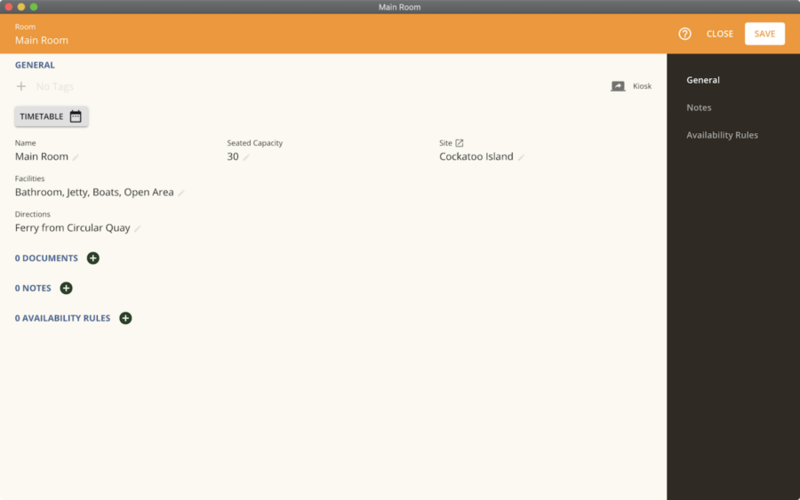 Just make sure that you set the address details completely and the map will automatically generate. This small section is a quick view of the rooms detailed for this site. You can add new rooms here by clicking the + button, then adding a room name and the seating capacity. Clicking the More Options button will take you directly to the Room details window. See the the section called “Room Record Details” section for more details. This section is for internal notes about the site. It is not published on the site. Availability Rules will allow you to set when the site is not available. By clicking on the + sign, you can set when the busy period starts and ends as well as the option to select "all day", this is good for something like construction. You can also add a description for the unavailability e.g; "construction on this site on 2/2/11". When you create a new Site within onCourse and flag it as a Virtual Site, onCourse will automatically assign a Virtual Room to that site. The reason for this is that Class enrolments must be assigned to a Room, they cannot be assigned to just a Site. Whilst this virtual room record is hidden within the user interface, it has been created automatically when the Site is flagged as being a Virtual Site. You can also convert an existing Site to a Virtual Site by ticking this box within the General tab of the Site Record. Please note that if the existing Site which you wish to convert to a Virtual Site has more than 1 Room allocated against it, it cannot be converted to a Virtual Site. Here you can set the Room name, the site to which the room is related , room capacity, room specific directions for once the student is at the site and add details about the facilities available in that room. There is also an attachment window available for things like images (see above for more on the attachment window). You will note that the Facilities and Directions fields within the Room record is part of the dynamic course content which is automatically published to your onCourse website. This tab is for internal notes about the room. It is not published on the website. Here you can set room availabilities (see above for more on the availability rules). The next step in setting up your onCourse program is entering sites and rooms. You can give each room a name, specific directions on how to get there, and describe the facilities that are available. It also allows you to make it possible for students to view detailed maps and instructions from your website about where their class will be held, saving your staff time with phone calls giving directions and saving students frustration when they can't accurately locate the venue. Creating sites and rooms is a valuable part of your training resource management. Every time you book a session in a room, the Classes timetable is updated and the room becomes scheduled. This means that if you try to book another session in this room at the same time, you will be notified that it is already booked within the Class > Timetable tab. It's important to note that onCourse will not prevent you from double booking a room. If you have a room or site that you hire on a casual basis you can also set the availability for it. For example, you may hire a public hall on Wednesday evenings. When you set up this room, you can specify it is only available for you to book between 5pm and 9pm. Course coordinators scheduling classes will an error message if they try to book a class in this room on another night, or to start before 5pm. It is a good idea to enter the sites and rooms first so later when you add the courses you can easily assign them to a location. From the Sites list view, click on the + button. A new site screen will open on the details window in the general section. In the Name field enter the name of the site e.g. Waverley Campus. Remember the site is where the rooms are located and is not the rooms themselves, that comes later. Enter the street address of the site. If you report AVETMISS your sites must have accurate address suburbs and postcodes. Once you've entered the complete address, a Google Maps image denoting your sites location will appear. Move to the Directions section. 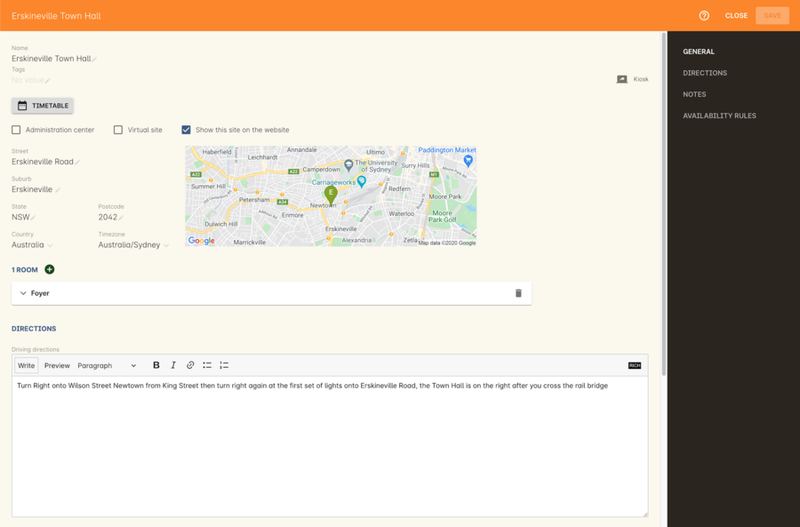 If you have specific driving directions, public transport directions or special instructions like parking, you can add them here. This information is published to your ish website. Because these description fields are Rich Text enabled (the blue A indicates this) you can add hyperlinks to local bus timetables or other useful pages for your students, like transport infoline or your local equivalent. If you have any internal notes about the site, you can add them on the notes tab. These are not published to your ish website. To set an unavailability for the site, go to the Availability Rules section and click on the + button. Create a new availability rule by clicking the +and define the Start and End date and time. You can also select 'all day' instead of selecting a time period. Choose if you wish to repeat the unavailability and the end date of the repeats. You also need to add a description of why the resource is unavailable. Click save. Once you have saved your site, click Close to be returned to the list view. From the site list, double click on the site you want to add rooms to. 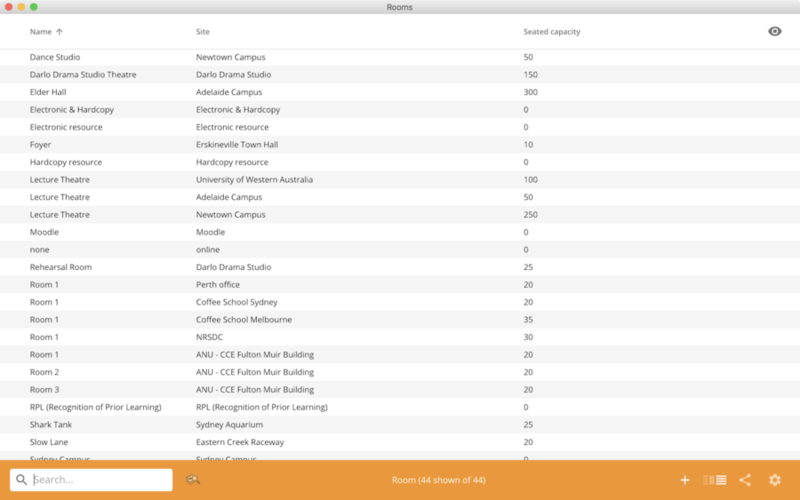 Alternatively, you can open the Rooms list from the splash screen and click on the + button. Enter the name of the room e.g. Studio 1. If your venue only has one room, such as a community hall, you still need to create at least one room so you can link a class to the room. Enter the seated capacity. This is how many people the room can hold. If you try to book a class into this room that has a maximum student number greater than the seated capacity, you will get a warning. On the Direction tab you can enter the directions to the room e.g. ground floor, level 3 and the room facilities e.g. tables and chairs, screen projector. If you have any internal notes about the room, you can add them on the notes tab. These are not published to your ish website. To set room availability, go to the Availability Rule section and click the + button. Click save to save the record, then click close to return to the list view. To edit any of the information you have entered simply click on the room or site that you wish to update. This will bring up the edit screen for that record. Make your changes and click save.